My posts on the National Education Association’s 2009 Representative Assembly have focused so far on a new business item I introduced calling for a national strike for full funding a corporate expense. I should note, though, that aside from the brief time it took to squash that motion, a few other things happened during the four days of meetings attended by 9000 delegates from all over the country. 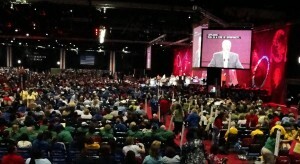 About 9000 delegates attended the NEA RA. So after the California delegation voted on July 3 to oppose my proposal for a two-day nationwide strike for fully funded public schools I considered some options. Political Strike for Equal, Quality Public Schools… A crazy notion? When I passed the form for the NBI down the row at our early-morning meeting of the California delegation, most looked at the proposal and passed it on to the next person. After getting a “critical mass” (20 or so) signatures, mostly by talking with people one-on-one about it, the signatures came much more easily. That was interesting in itself. One reason many people initially dismiss the idea of an unprecedented mass action such as this is the assumption that nobody else will support it, so it seems ridiculous. 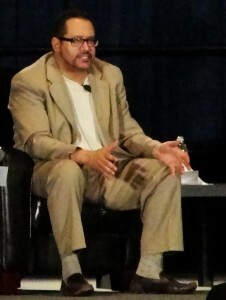 In fact, author Michael Eric Dyson pointed precisely to that fear, when I asked what he thought about this proposal. NEA will launch a massive media campaign this summer and fall, paving the way for a 48-hour locally-initiated, nationally-coordinated political strike and teach-in at strike schools in January 2010.